A Pesantren Waria (Islamic boarding school for transgenders) in Yogyakarta has once again opened its doors, and brought the subject of freedom of religion for all ― regardless of sexual orientation ― back into the public arena. After the death of its founder Maryani last month, the school moved to a house belonging to Shinta Ratri, a lesbian, gay, bisexual, transgender and transsexual activist, in a heritage area in Jagalan, Kotagede. “Everyone has the right to observe their religion in their own way,” said Faithful People Brotherhood Forum Yogyakarta Abdul Muhaimin, an advisory board member, in his speech at the launch of Pesantren Waria Al Fatah in Kotagede, Yogyakarta, on Friday evening. Muhaimin said humans were not allowed to undermine others, including transgender people, since everyone was made by God. “According to the Koran, we are not allowed to classify people based on economic, social, political, gender or theological values,” said Muhaimin, who also leads Nurul Umahat Islamic boarding school for girls in Kotagede. He said although transgenderism was not specifically mentioned in the Koran, it had been discussed in fiqh (Islamic legal philosophy). “I hope the students here are strong as they must face stigma in society. We have to care for them (transgender people),” he added. Muhaimin lauded the reopening of the Pesantren Waria, which was originally located in Notoyudan. Waria is a portmanteau of the words for woman (wanita) and man (pria) and is often used to describe transgender women. Maryani had received local and international media attention since 2008 when she transformed her home into a place for transgenders to study Islam. She made headlines last year due to her failed pilgrimage to Mecca, Saudi Arabia, last year after her efforts to go to the holy land failed due to documentation problems. Maryani’s dream to make the pilgrimage eventually came true. She flew to Mecca on April 26 and returned May 5, and performed all the pillars of the umrah (minor haj), covered from head to toe as a woman. Dozens of transgenders, NGO activists, students and domestic and foreign researchers attended the reopening of the school. Wearing mukena (female prayer dress) and sarongs, the transgender women conducted evening prayer together side by side. After praying, Muhaimin cut a nasi tumpeng (rice cone) in celebration of the opening of the school. 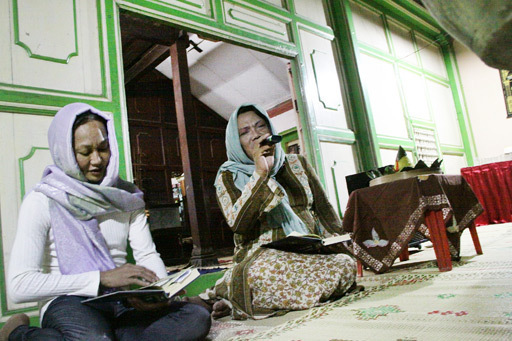 Shinta said the school, which was supported by the Nahdlatul Ulama University of Jepara, Central Java, offered students various subjects, such as transgender and Islam, Koran reading and shalat praying lessons. “There are currently 35 students at the school,” she added. Besides learning Islamic studies, Shinta said the school planned to facilitate ways for its students to make money. At the old location, the women had a beauty salon and also rented traditional wedding dresses. “I hope the school can give students self-confidence. Being transgender is not a sin. It is allowed in Islam as far as it’s genuine, not fake,” she added. Meanwhile, Wulan Agustina, a student at the school, said she could now read the Koran and conduct shalat praying after enrolling at the school. “I also took religious studies, which can strengthen our will to face the hardships of life,” Wulan said.